Our first French campsite ~ Kawan Village Le Val d'Authie. The picture is of the Saturday morning village market. This area is lovely, flat farming country-side, small villages and amazing sandy beaches at Quend-Plage. The campsite has a fabulous restaurant which was open, even in April, when we were there. We thoroughly enjoyed our first restaurant meal in France. We wholeheartedly recommend a visit. We enjoyed touring around this area, finding picturesque villages like Vron, Rue and Quend. On a more sombre note, this is the area of the Battle of the Somme and there is much of history to see and ponder in places like Saint-Valerie-sur-Somme. We left Picardy on 21st April in bright sunshine, 19°! 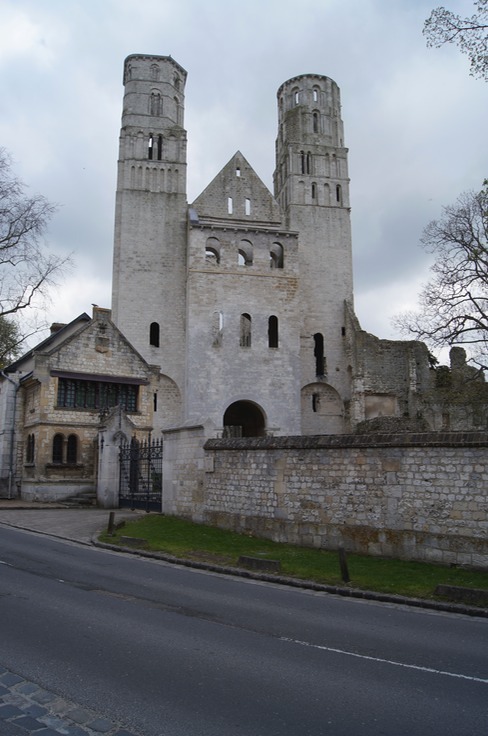 We'd had 2 lovely, relaxing days in Le Val d'Authie and were now on our way to Upper Normandy and Camping de la Forêt. A very pleasant drive down the motorways - A16, A28 then to a village called Jumièges. We'd not seen any LPG since arriving in France but my confidence in being able to find any for our gas system was restored as I was able to fill up both gas and diesel tanks in a service station on the A16. The wine around here is amazing and very cheap by UK standards! So that was all tanks filled! We had to allow time to plan our onward travel and washing and cleaning needed to be seen to. Woke to a cloudy start to the day so chores weren't such a hassle. Went into the village of Jumièges - so pretty. Not much in the way of shops, a wee grocery store and a patisserie we couldn't resist, result, two of the most delicious chocolate éclairs filled with chocolate cream, yummy. We passed a church with a cemetery - what beautiful headstones and memorials they have in France. Next "trial" was to try and establish where we could find a supermarket - the site staff have next to no English, which is OK, it is our problem! Eventually got what we needed (if not quite what we wanted) after visiting two villages. The villages here are so pretty, lots of colour from floral displays. Cars also abound as parking anywhere seems to be OK, sometimes the engines and radios are left on for good measure! Never mind, we are so enjoying this look into another culture and look forward to what tomorrow brings. From our Journal : Margaret : 22nd April 2013. We drove to Rouen today - what a beautiful city! However, on the way in the car displayed three amber warning lights - engine, VSC and anti skid. This is not good we thought! Our waiter, above, came to the rescue. Notwithstanding our poor French and his lack of English, he took charge of the situation and was able to direct Toyota Assit to the right deck of the parking garage. A man came within an hour and fixed the problem! Wonderful! This is good we thought! We walked around the Centre of Rouen, saw the Cathedral de Notre Dame - fabulous; and took some photos of some other beautiful and ancient buildings. All in all, a lovely day. We bought two sets of boules so that we could play petange at the sites we stay at. We found a lovely wine shop and bought a very interesting and recommended bottle of cognac - looking forward to sampling that. We felt very good about the day as we made our way back from Rouen - the SatNav gave us a splendid but unscheduled tour around Rouen as we responded to several ambiguous instructions!!! On our way home the dreaded warning lights came on again! This is not good we thought! Toyota are now searching for the nearest available Toyota Garage that we can take the car to tomorrow morning - this may mess up our scheduled next stop ... but let's see how the morning goes. We are feeling very positive and able to cope with anything. Going to dinner this evening (Ce Soir) in the village. Day 12 Report : Our dinner last night was fabulous. The restaurant, La Taverne, Jumièges, itself did not look much from the outside but my goodness, the food was delicious, and very french! Margaret had Bayonne Ham with gerkins and salad to star; I had Foi Gras with fig jam - it was sensational! Mains were cod in a curry sauce with mushroom / courgettes for Margaret, I had canard in a wonderful raspberry sauce - delicious! The wine was a St Emilion and was an excellent accompaniment to a brilliant meal. I also had a sorbet into which they poured calvados - amazing! All this followed by a cheese plate and a desert. Nom, nom, nom! Still at Camping La Forêt; have had to stay another day so that we could get the car to a Toyota Garage. That took all morning! As is normal with us, there was a fair bit of misunderstanding between us and the SatNav which led us a bit of a dance around the suburb of Rouen called Petit Queville; not helped by the fact that Toyota European Assist sent us to the Toyota Showroom - the service centre was a few kilometres away from that! However, there is a fault to a sensor, not to a vital part of the engine so we were assured that we could continue to drive the car, although the warning lights would persist. The service centre made no charge for their help. Thank you, Toyota. The weather today has been fantastic; I think over 20˚ this afternoon. We had a restful aprés-midi at the campsite; sunbathing, reading; very nice. Les chiens have been great! I think Maya would prefer a beach to run around in but she'll have to wait another 3 days before we get to one… on the Atlantic coast. Off to Montsoreau tomorrow, to the Kawan Village L'Isle de Verte Campsite. Montsoreau lies between Anjou and Touraine and has the River Loire as prestigious setting. The 15C castle made famous by Alexandre Dumas’ novel "La Dame de Montsoreau" is reflected in the waters of this legendary river. All around, flower-decked streets with slate-roofed, white tufa houses and green pathways lead to the Saumur vineyards. 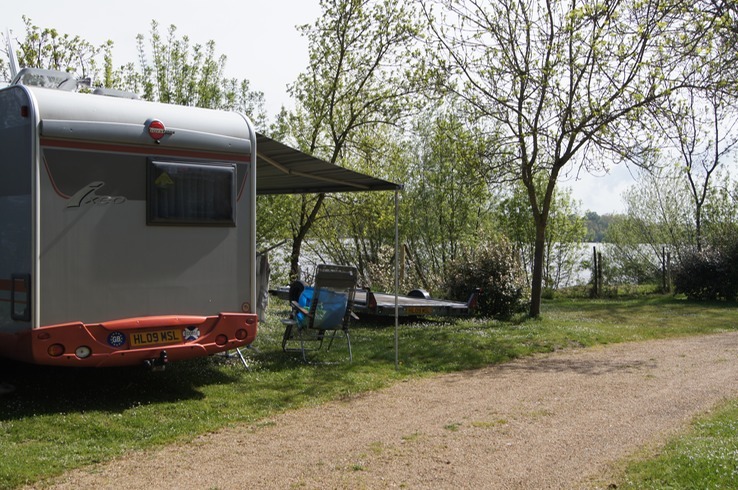 Well, here we are in Montsoreau sitting by the banks of the Loire in brilliant sunshine – 26˚! 😎 😎 😎 Just had dinner, coquilles St Jacques, steak, mushroom, chips, followed by crême caramel, and now planning sitting out for a wee while longer. Lovely drive here, but very long, especially in this heat. Stopped for a break halfway. Satnav did it's work without compromise for a wee change 😊. Forecast is for rain tomorrow, but we are gob smacked by the beauty that surrounds us. A cold day! Down from 26 to 15˚!!!! We had Internet issues yesterday so found ourselves incommunicado most of the day; a strange experience! 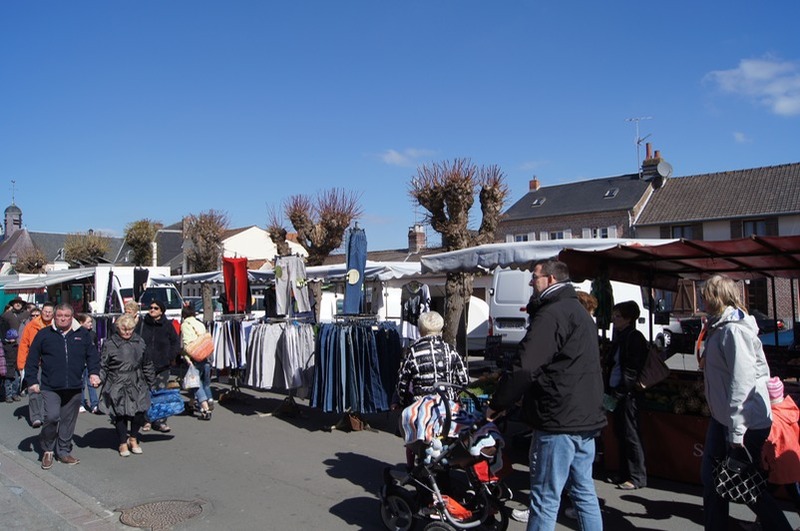 Vendredi 26th April was a 'maintenance' day - washing, cleaning and motorhome essentials + the joy of locating another super Marché! However, great success! We were directed to Saumur, a beautiful town full of elegant and ancient buildings AND an enormous supermarket - L'Eclerc. This was more like it; we could get everything in one place, including excellent wine and cognac. We had a lovely lunch in the retail complex that is anchored by L'Eclerc. The Boulangerie and Patisserie had a magnificent array of cakes and pastries; we could not resist a Gateaux St Honore each - we last tasted a homemade version in Inverness in the 1970's! Ours was better! 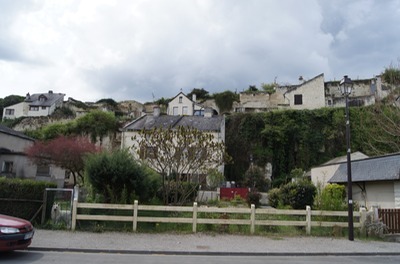 It is curious that many houses have been built into the cliff in this village - quite incredible! Lost our Internet again this morning, very fickle service here. This is a lovely peaceful site; the views over the Loire are gorgeous apart from the ugly iron bridge we had to cross to get here. This bridge is v-e-r-y narrow, if we had met a lorry or a caravan coming towards us it would have presented quite a challenge. Only problem with the site is the loos - no toilet seats! Very strange! Hope tomorrow's site has all the necessary bits and pieces. Apparently beautiful beaches abound there so M and M will at last be able to run off energy. There are no official dog walks on French sites, so they always have to be walked on a lead. A challenge we faced yesterday was in the Pharmacy. Homer’s nose is very sunburned and I had hoped to get a nose mask; seen them in Boots. Having looked ourselves with no success a very helpful young lady offered to help. With the aid of her little English, our little French and the nearly useless Lonely Planet phrase book we have, we left clutching a tube of cream that "heals skin very fast". We still have not learned our lesson in that French supermarkets do not give plastic bags for your shopping so we end up a problem. Need to remember to take a bag with us next time. For once I really enjoyed food shopping yesterday. Apart from the wee supermarket in Rue last week, the others we have visited have been rather lacklustre in their offerings, but yesterday's offered a much better variety so I was able to stock up the cupboards for a day or two. We fancied Kedgeree last night, but found the cooked rice had a texture more like pudding rice and the smoked fish was rather mild, not good for our taste buds but good for a more fragrant motorhome. Bought some Carte D'Or ice cream - pear, vanilla and caramel fondant - don't see that in Tesco. Magan and Maya seem to be enjoying themselves. There is a pathway between our pitch and the river, so they have plenty of entertainment as walkers and cyclists go by. So far no one appears to have fallen into the river due to the cacophony of sound emanating from our pitch. On each site we have been allocated a huge pitch away from everyone else, do you think their reputation is preceding them? We sat outside in lovely sunshine earlier, but it's now raining, the first time we have seen rain since we left Folkestone. The wind is getting up too, not so friendly at the moment. When it all calms down we are planning a visit to Samaur to take some photos and maybe find a take-away instead of going out for a meal tonight. If we do find one it could be fun choosing from the menu. 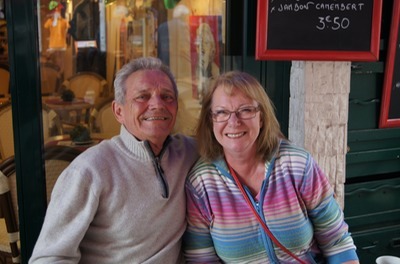 We had booked to stay next at Les Brunelles, Longeville sur Mer, Loire Valley from Sunday 28th April and had driven 184 kilometres to get there. On arrival, we immediately saw that this was very much a busy holiday resort for families; lots of children enjoying the pools and structures. Nothing at all wrong with that but we prefer somewhere a little quieter. 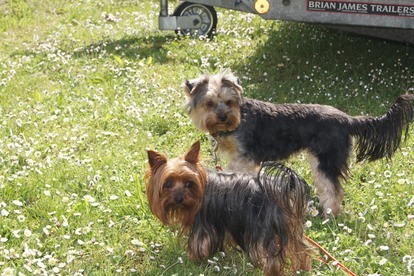 However, when I went to check-in it quickly became apparent that they would not accept our two Yorkshire Terriers! One dog would be OK, but not two. Have you seen the size of Magan and Maya?. 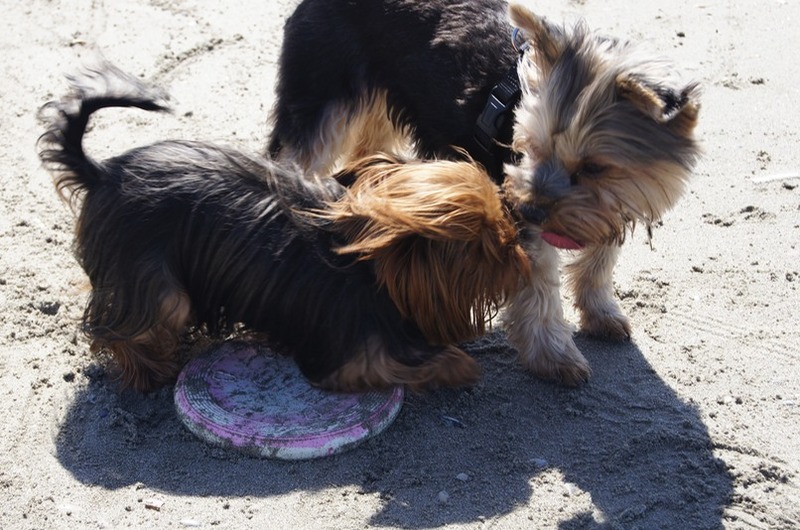 They might have eight legs and two heads between them but together they are still smaller than most dogs. 😢 This was the only time we encountered the problem in the whole of the trip. Usually, if there is a rule about dogs, campsites stipulating Dogs MAX = 1, they mean that one dog is included in the pitch price and charge a supplement for the other. I always specify that we have two small dogs when booking, usually by e-mail, but this obviously had not been noticed at the time. Now the reception staff were apologetic and very helpful; taking time with me to find an alternative campsite, then phoning them to check both for availability and their pet policy. Castel 5-star campsite La Garangeoire was over another hour away but turned out to be much more our ideal than Les Brunelles, so we were pleased. 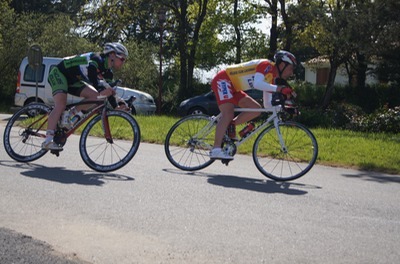 However, as we approached we found that the roads in and out of the village of St-Julien-des-Landes were closed to traffic as there was a cycle race in progress. We were directed to a nearby lochside car park to wait until the event was over. That gave us an opportunity to spectate as the cycles went round the circuit. Got some decent photos. The weather was beautiful and the area was spectacular so we didn't mind waiting. The pace of life in rural France is slow and peaceful. This area is beautiful and is everything we Brits could wish for. Small villages to admire with traditional Boulanger-pâtisserie, Boucherie; beaches for les chiens, rolling countryside - lush and green. None more so than than area surrounding Saint-Julien-des-Landes. Not far is the Atlantic Coast, with great beaches at Les Sables d'Olonne and Brem-sur-Mer.